Winter with its harsh frost is not a reason to delay a wedding ceremony, right? There are plenty of couples who choose winter time for celebrating the union of their hearts and souls. So, today’s wedding album free WordPress theme will help you to set up the best wedding memories properly. For instance, I agree that every season is beautiful and special. However, winter for me has a holiday mood with snow, lights, Christmas tree, the family circle, gifts, and an absolutely charming and cozy atmosphere all around us. Who knows, maybe, that is why winter weddings look so sweet and captivating. If you’re going to develop your niche business doing wedding photography this winter, consider a wedding album website. It could help you to describe yourself and to present your activity and creativity professionally. The main thing here is to show your prime goals and your own style of how a wedding album should look, so you are able to work with more clients and gain more widespread promotion. For this reason, we created a free wedding album sample powered by WordPress. Let’s see what elements it has inside to make sure it is really what you need for your wedding album site’s project! 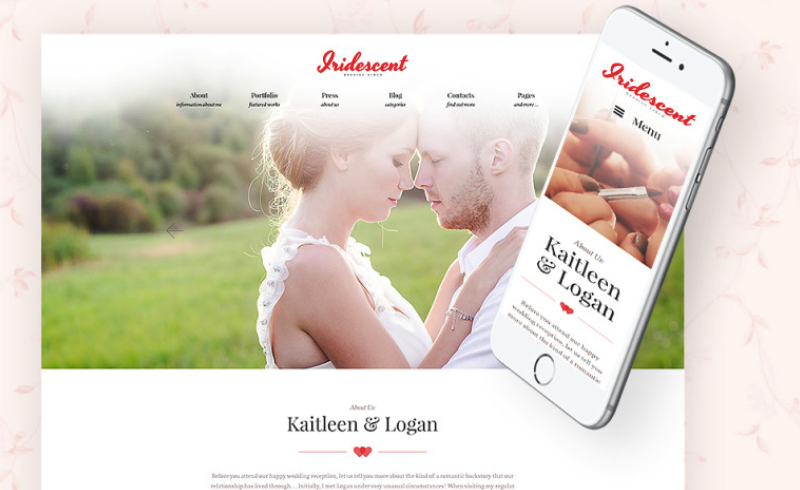 Iridescent wedding album free WordPress theme comes with a truly gentle design with a calm and pleasant color palette, delightful backgrounds, multiple web fonts, and Parallax animation. Consequently, your wedding album will have an amazing look! This cross-browser compatible and SEO-friendly theme boasts a fully responsive design. 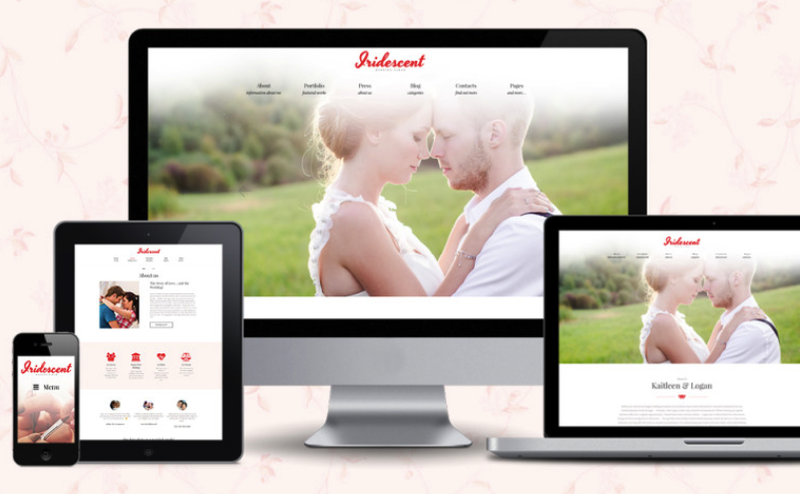 Therefore, your wedding album website will perform brilliantly on any modern device with any screen resolution. Iridescent WordPress theme has a strong foundation, which is Power Page builder. This modern tool allows you to build your site with ease thanks to its drag & drop functionality. With Power Page builder you have access to a variety of configuration options, exclusive modules, presets and much more! WordPress themes present themselves as some of the most simple solutions for building good-looking websites. Why? One of the reasons is a seamless WordPress Live Customizer, which provides you with versatile theme options and a live site editing process. Now you will be able to customize your website with no need to keep reloading the page! Basically, these modules will help you to enrich your website with any type of content you want. 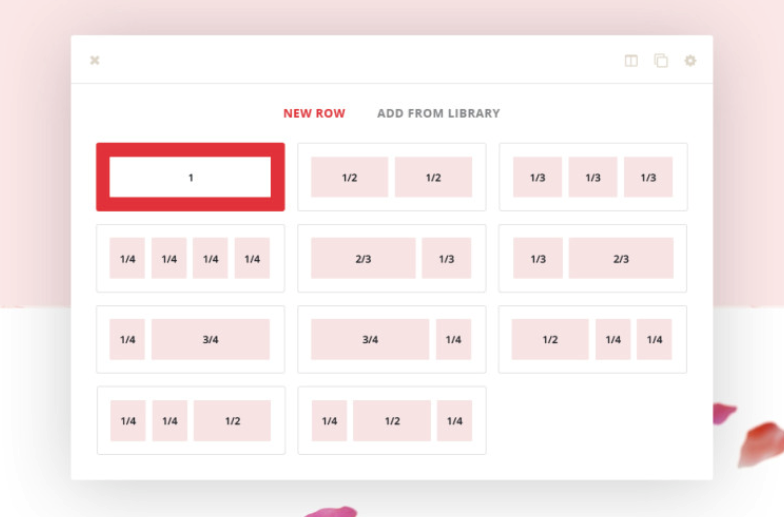 Moreover, each module features multiple options, and you can easily tweak them the way you like. 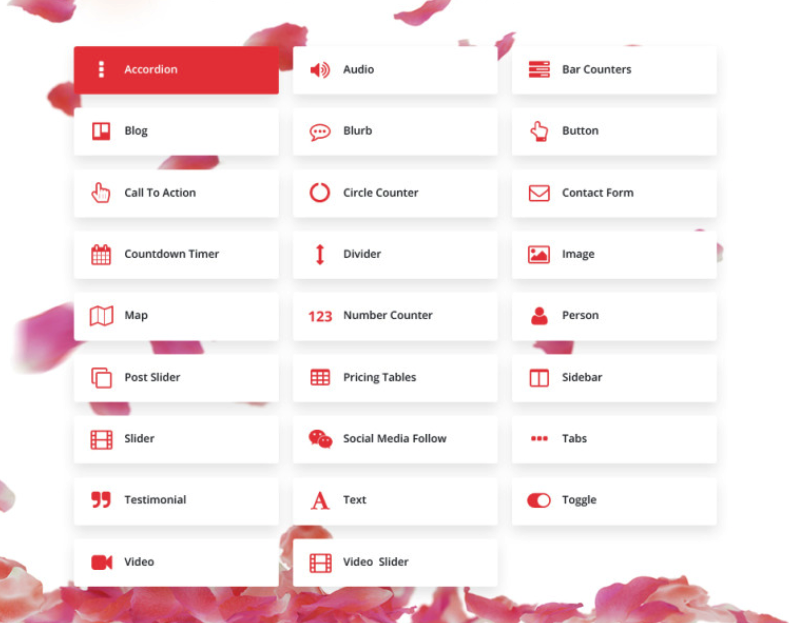 Here you get different buttons, pricing tables, sliders, and more! 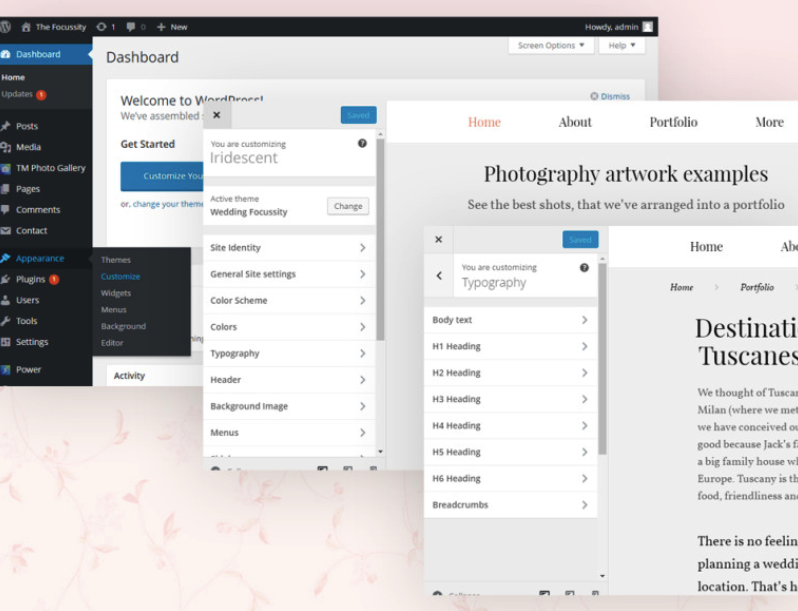 Thanks to multiple layout options Iridescent allows you to enjoy experimenting with the structure of your pages. Additionally, there is a neat pre-built library, which allows you to set to one side all the layouts and use them whenever you need to. As you can see, this wedding album free WordPress theme has tons of stunning tools for building a profitable website for a wedding business. Also, the Iridescent theme has a powerful TM Gallery, an ultra clean code, hassle-free documentation, a truly intuitive installation process, and a lot of other features that you can see while exploring the demo. By the way, you can easily download this theme to see how it works with all its ins and outs. Just remember, that free samples were created for educational purposes only, so, you can learn how to build sites on the fly. 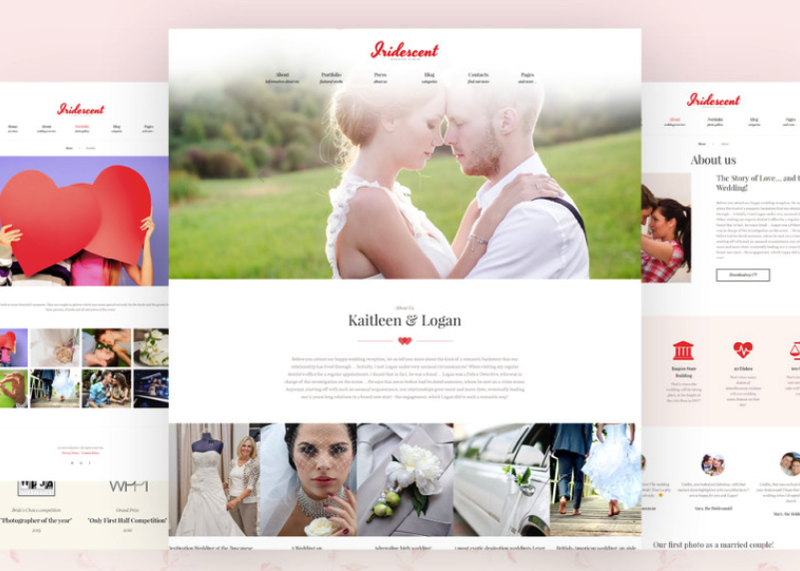 In case you are already prepared to create a wedding album website of your dreams, take a closer look at our premium wedding WordPress themes collection! How do you like this wedding WordPress theme? Please, share your experience of working with this free sample in the comments section below! Make stunning wedding shots and enjoy your day! This entry was posted in Free Stuff, Free Themes, Wedding. Bookmark the permalink.